Walking into a wine store without knowing what I want can be as bad as walking into Blockbuster without knowing what I want. It’s always the same: After forty five minutes of doing isle laps, I pick a bottle with a good looking label and pray I haven’t chosen the wine equivalent of Leprechaun 4: In the Hood. Then, after the store clerk tells me my wine will only pair with Kazakhstani lutefisk I get the sinking feeling that drinking this wine with the pizza I had planned for tonight would be the pairing equivalent of showing the kids Reservoir Dogs. In the past I’ve used “red wine with beef, white wine with chicken and fish” as my pairing compass but I can’t continue to attempt brain surgery with something as crude as a wrench. A new tool is needed to help with this challenging dilemma. I need something more complex with more options to address the subtleties of hundreds of spices and grape varietals. Natalie MacLean, wine critic and sommelier, has the answer: The tool is called “Food & Wine Matcher” and is on her site here. With two or three clicks of the mouse I can now narrow my choices to a short list of wines that go with my dish. Tonight, for example, I’ll click on “Pizza” and a list of options appears. From those options, I then click on “Combination” and behold, there’s my short list of wines to drink with my combination pizza. For something so robust, the tool is very simple. The matcher will also go the other way where I can start with the wine and after two or three clicks have my short list of dishes to serve with it. At this time Natalie does not have a movie/wine pairing feature on her matcher. I’m sure having one would have spared me from Earnest Goes to Camp. However, by using the matcher I did learn that this week’s recommendation is extremely food friendly. 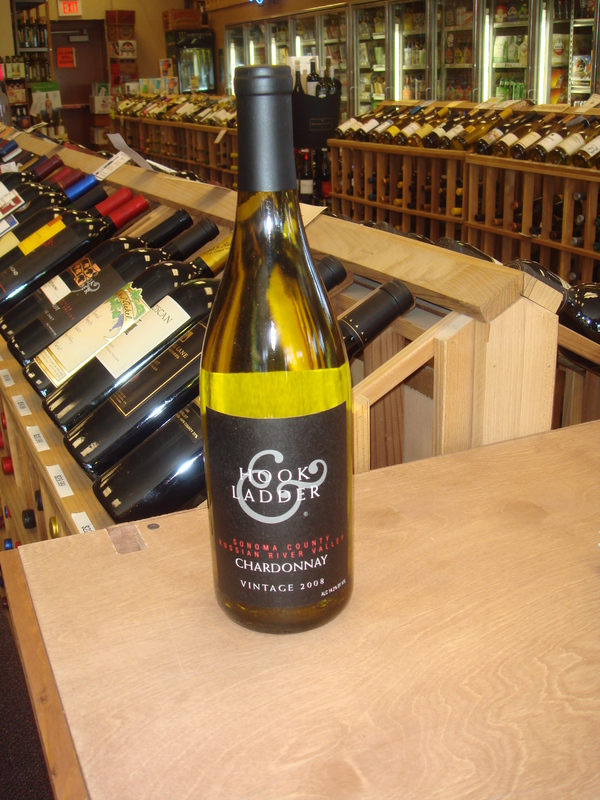 Hook & Ladder 2008, Chardonnay ($17.99): This wine reminds me of a high school kid that has their act together: It’s youthful, fresh, crisp, and has a Sprite-like lemon-lime taste but at the same time it uses a refined amount of light oak to lend it a degree of sophistication. I like surprises. I don’t mean the kind where you arrive home to find your back woods in flames. I mean the other kind where you’re bumbling along and something unexpectedly good happens: Your blind date turns out to be hot, you get home five hours later than usual to find that your dog indeed has waited for you, you review your finances to find you really do have the money to take that trip to France (okay, this one hasn’t actually happened but I’m still hoping). That kind. My most recent wine surprise happened when I got a recommendation from a wine store clerk wearing a Metallica t-shirt. Not that 80’s era rock band t-shirts necessarily disqualify someone as a knowledgeable wine critic but I was in a hurry and it’s all I had to go on. “It’s like totally complex and everything,” he said. Hearing those words reminded me of past girlfriends where being described as “complex” was another way of saying “problematic”. Not wanting to appear as if I completely rejected his recommendation, I took the bottle. What the heck, it was only nine bucks. I brought the bottle home, placed it in my cellar next to my other cheap wines reserved for weeknights and promptly forgot about it. Weeks later when it was the only bottle left, I decided to open it in the spirit of discovery and exploration (Or desperation. It was the only one left). “It’s like totally complex and everything,” I blurted after the first taste. After discovering Luzon, I now I know how the junior high school coach feels when he discovers he’s got a future pro hall of famer on his team who so outclasses his peers as to make them somehow appear inbred. This was simply the most complexity per dollar I could ever remember. For anyone looking for a good entry into a “European styled” wine without the need to see your banker first, this is an excellent candidate. Luzon 2008, Jumilla ($8.99): Tasting Luzon reminded me of a group of kids in the Scared Straight program: Licorice, mint, raspberries, smoke, and all the other characters were in attendance but none of them dared take a step out of line. After a little more research, I discovered the 2007 vintage was named Wine of the Year by Wine Enthusiast magazine. Luzon is a great example of balance and complexity. “Well, what are you looking for?” asked Bradley. I knew his name was Bradley because he wore a nametag saying “Bradley”. That’s a hard question in a wine shop. It’s not like going to a store that sells, say, buckets, where you can say—“I’m looking for a bucket” and the clerk will happily point one out that’s virtually the same as all the other items in the store. And I couldn’t state the obvious—“I’m looking for a good wine,” either as I doubt any shoppers enter the store and ask for a delicate little wine that is bad to perhaps only slightly sub par. So in the end, and in the interest of saving time, I said, “Something I can take to a party that nobody has tried before and I can be sure won’t embarrass me.” Without hesitation the clerk led me to the back of the shop where a small group of Canadian Wines sat. “Canadian wines?’ I thought. In my mind I already saw how the party would go: The other party guests who got their recommendations from sommeliers and other enlightened Swamis would receive copious accolades for the bottles they brought while I spent the evening in the kitchen hiding behind the garbage can wondering why I just hadn’t stuck with California. SOLD! I wondered if I could just blame the selection on my wife. Later that night, as the host opened the wine, I anxiously looked toward the exits. I still had time to visit Bradley for a refund. I imagined a wine from Canada would be something like an Amish electrician: good enough to service the locals but not really ready for the big-time. I couldn’t have been more wrong. Party goers loved it and quickly refilled their glasses as I began spewing the few facts about Canadian wine I learned from Bradley at the register. Canada has produced wine for over 200 years. The Niagara Peninsula in Ontario is about 100 miles due West of New York’s Finger Lakes region and currently hosts more than 70 wineries. The wine below is a perfect example of their quality. Vineland Estates 2008, Semi Dry Riesling ($14.99): Sweet, yes but it’s kept in check by a hint of minerality that reminds me of tasting a wet stone. There’s also pear, grapefruit, and honey…..eh? You are currently browsing the The Wine Rogue blog archives for May, 2010.